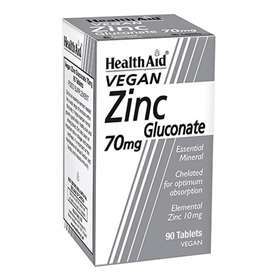 HealthAid Zinc Gluconate contains zinc which is used by the body for many functions. Zinc can helps stimulate several enzymes and is therefore involved in normal cell growth. It can also help sexual maturation, healthy immunity, digestion and the maintenance of supple joints. HealthAid provides Zinc Gluconate tablets that are easily absorbed and digested by the body for maximum effect. Could be helpful to men wanting to improve male health and by everyone to help increase appetite, immunity and wellbeing. Free from yeast, gluten, wheat, dairy, sugar, salt, artificial colourings, preservatives and flavourings. Suitable for adults and children over 6 years of age. Children 6-12 years old: Take one tablet daily with a meal. Adults and children over the age of 12: Take one to two tablet daily with a meal. Do not exceed recommended daily intake unless advised by a suitably qualified person. Not suitable for children under the age of 6 years old. Long term intake of this level of zinc may lead to anaemia. Zinc Gluconate, Bulking Agent (di-calcium phosphate, microcrystalline cellulose), Stabiliser (crosscarmellose sodium), Anti-caking Agent (silicon dioxide, magnesium stearate), Binding Agent (acacia gum).